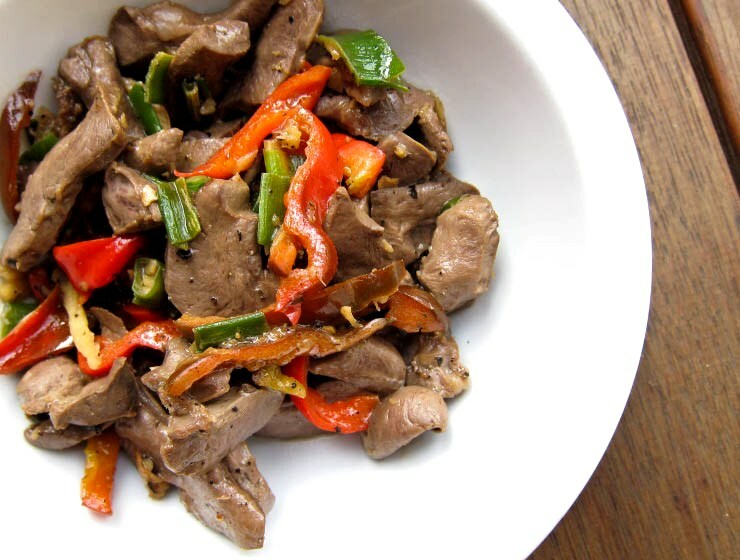 Stir-fried lamb's heart (plus capsicum and spring onions) with lemon, pepper, ginger and soy. As an omnivore who often enjoys vegan and vegetarian meals, but still loves the taste of meat too much to give it up, I like using the parts of animal that are often neglected and could otherwise go to waste. The following story and accompanying images contains content that may be off-putting to those who are not comfortable with offal. However, if you are interested in trying it out, I am of the opinion that heart is a good starting point. The taste is quite gentle, and the texture is conventional enough - some may even prefer it to meat. I've had chicken heart before, which I found to be quite delicious. This is my first experience with lamb heart, and I feel equally positive about it. 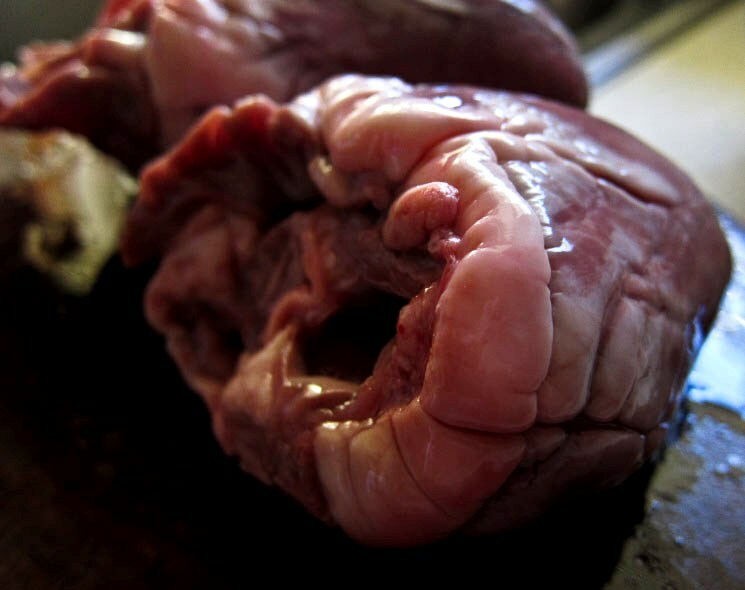 Lamb heart, when raw, has a fairly rich, fleshy scent. When cooked, it has a pleasantly mild taste of lamb and a tender texture. Other than a stir-fry like this, I can also see myself throwing it into a pho or a curry laksa! And for those of you who already embrace offal - enjoy! Girl goes to Victoria Market with parents, uncle and aunt. Girl meets lamb hearts (only 80 cents each! 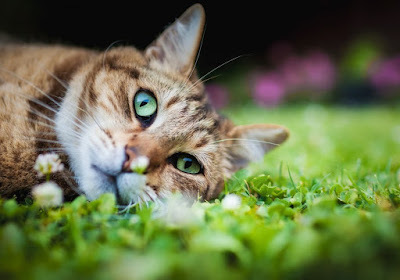 ), is intrigued at first sight. Girl points out the lamb hearts to mum, who regards them with unconcealed disgust. Girl points out the lamb hearts to dad, who is as curious as girl and encourages her to buy a couple. Girl gets home and decides to stir-fry one lamb heart for dinner. Girl's mum helps by preparing the lamb heart - trimming off the fat and tubes; cutting the glistening dark meat into thin slices. 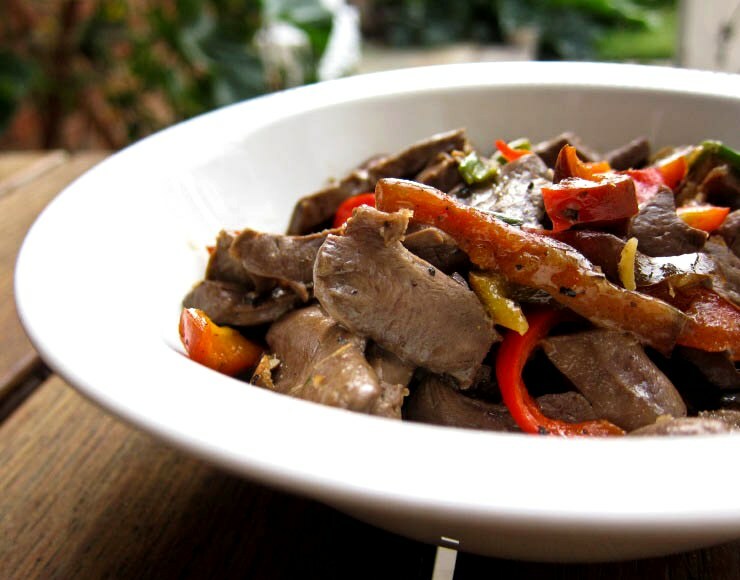 Girl marinates lamb heart in lemon, ginger, soy sauce and black pepper, then stir-fries it in a wok with capsicum and spring onion. Girl serves up lamb heart stir-fry for dinner, enjoys it with dad as the rest of the table keeps their distance. The cross section of the lamb heart. Sorry, it's not really getting more attractive is it? First, prepare the lamb heart. 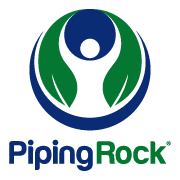 Cut off any vessels, valves, tubes and the like. Trim away excess fat (that would be the white bits on the outside). Basically, you want get it down to that meaty-looking maroon part of the lamb heart, which you then slice into strips. Create a marinade by mixing together lemon juice, soy sauce, ginger and black pepper in a bowl. Toss the lamb heart in and mix well, then cover and keep in the fridge for an hour. Heat up some oil (half a tablespoon should do) in a wok or pan over a medium high heat, then stir-fry the lamb heart until the pieces start to change colour. This could take less than a minute, depending on their thickness. 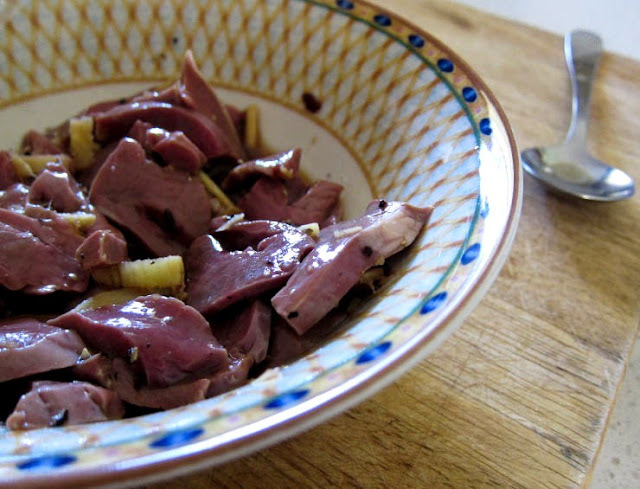 Lamb heart gets tougher when it's overcooked, so try not to dilly-dally. Add in the capsicum and spring onion and stir-fry for another 20 seconds. Taste and add more seasonings if desired. Transfer to a plate and serve immediately with steamed rice. The result: a not-that-scary and rather scrumptious offal dish: lemon-pepper soy-ginger lamb heart stir-fry. I too LOVE to eat the parts of animals that others prefer never to even mention let alone eat. We ahave become so removed from food and where it comes from that people are scared to eat most things. I guess part of it comes from a place of not wanting to see so very much of the animal wasted, but it also comes from a childhood of my parents feeding me lovely lovely dishes of the lesser liked bits of animals. They didn't like waste either but better still were (and still are) great cooks. I was one of the lucky ones who ate offal as a child but it was cooked in a delicious way not leaving me scarred with memories of horrible dishes. Thank you, GourmetGirlfriend. I have similar thoughts and experiences. Back in Malaysia, my mum would often take me to the market with her when I was a child, and we would visit the old-school butchers with those huge slabs of meat hanging off the hooks - so different to the "sanitised" supermarket versions. And offal is often utilised in the food back home, too. Pig's blood cubes are not uncommon in curry laksa, for example. I tried a chicken heart at a Brazillian BBQ once and it wasn't bad. I probably would not go out of my way to by heart but if I was served this, I would definitely eat it and most probably would enjoy it. Thanks Anna! I'm interested in Brazilian food - hope to try their BBQ fare sometime. Teehee, we're like two peas in a pod! I tend towards vegan in the majority of my eating habits, but have a deep love for liver and pate that keeps getting in the way. You, my good woman, are full of surprises. Also, I think I must get an invitation to one of these Brazilian parties with chicken hearts. Anyone? Oh and my favourite dish with offal is probably bak kut teh. Hard to go past that one... also, soy braised pig ears and tongue which my mum buys from the pasar malam (night market). Yum. Oh, oh, heart and liver are actually very popular in France. You should try roasted duck heart brochette, with a dish of spinach and cream it is sublime :) This recipe is really something I would like to try. Take care leaf, and thank you so much! I've never cooked heart before, but I think it's great that there are such delicious looking recipes to stop offal going to waste! I love soy and ginger as flavourings, so this looks great. Have not tried lamb hearts before but I believe they should be nutritious. Tigerfish, I imagine so, too, it being almost pure muscle. Oh how unfortunate! My first chicken heart was tasty so I've thought positively about it ever since. Well done! I was thinking of taking the plunge and trying beef or chicken hearts the next time I see them - I'm not ahuge fan of lamb in general so I'd rather not taking risks here. I may adapt your stir fry recipe, it looks like it would work with any meat. Unfortunately chicken heart is one of the most horrible things I have ever eaten, so I can't be tempted by this, even though the stirfry itself looks lovely! Oh no! I was wary of chicken heart before I tried it, but I found it surprisingly pleasant. Perhaps you might like it prepared another way (if you still have the courage to attempt it again)? That actually looks really good. I haven't had lamb's heart before but no problems with offal. Shall try and be brave and cook it myself! It's a pretty good deal if you like offal, Winston. Happy offal adventures to you! I know. I understand. I grew up in cajun south so I am used to eating "parts". One of my favorite dishes is my cornbread dressing. It has minced up chicken gizzards and livers and I think it is just delicious! I would probably try your dish and more than likely like it! Your cornbread dressing sounds awesome, Sarah! I'd love to try that. Good story :D Offal ftw! Japanese yakitori (charcoal grilled chicken skiwer) includes all parts of chicken in the menu. I've never tried lamb version. It sounds delicious with lemon and soy ginger in it... I'd love that flavor. I didn't grow up eating lamb so I don't usually choose to eat lamb if I have other choices. This dish would probably change my mind - thanks for introducing a new recipe! Thanks Nami! I've had yakitori before, but not the ones with offal. I must keep an eye out for that. I have had bison heart stew and it was delicious, I am sure this is great. I think if you can't stand to look at it in its raw state you shouldn't eat it, so good for yoU!! I have just cooked, and eaten this...beautiful, amazing...I added bok choy and mushrooms to the stirfry...it was out of this world! This looks easy to prepare! 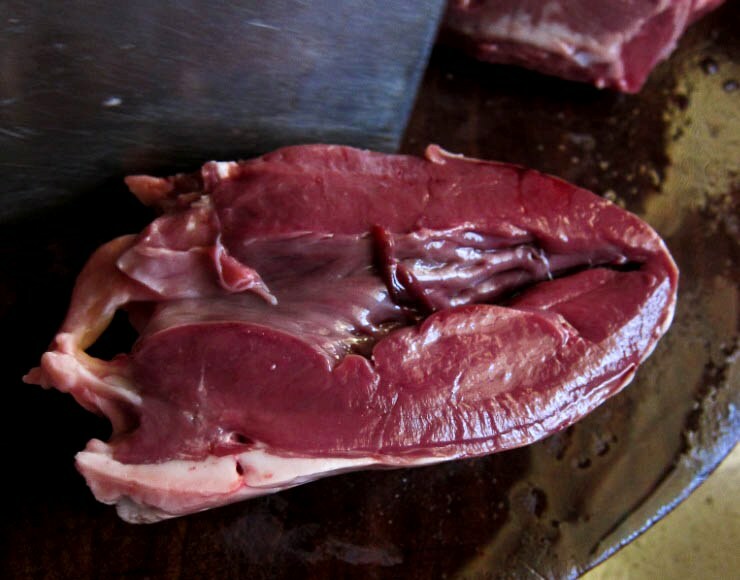 Actually, I really love eating liver because it's very healthy and delicious, and I will cook this recipe so that I can eat my favorite liver later. Thanks for sharing your recipe! zucchini tea. cool as can be.